There are lots of nods and references to the other games, even God of War III, as everything starts to pull together nicely. It does rely on you having a good memory of the first few games sometimes but don’t let that put you off. You can at least now line up all five titles and blitz through them in less than a week (warning: may destroy thumbs). 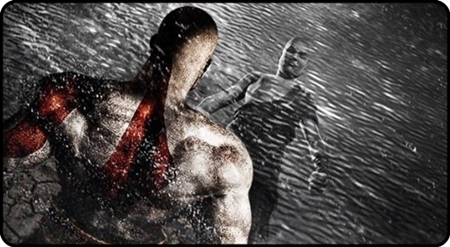 Kratos has a few new moves at his disposal, but not many. The Hyperion Charge is similar to a move in GOWIII, as Kratos rugby-tackles an enemy to the ground before pummelling him to pulp. The rest of them seem to be variations on older moves, but with a new name. There isn’t a great range of weapons on offer here. You’re later given a spear and shield, which can be used to protect yourself from walls of fire and wind or attack distant enemies, but they feel extremely sluggish compared to your chained swords, meaning you’ll only use them when the game demands you do so. Thera’s Bane is something new for the combat as it adds fire to the Blades of Athena by holding R. this not only does extra damage, but it’s the only way to destroy the armour on some of the larger foes or to destroy other shields. You have a separate fire meter for this and it replenishes over time, rather than relying on orbs. Combine fire with the series’ staple move, Cyclone of Chaos and you’re onto a winner. The overall moves list is short, but it’s still one of the most enjoyable and stylish fighting systems out there. Other magic spells are set to the d-pad. The electrical one is pretty much the same as ever, although with a different label. You earn a northern wind spell that will freeze enemies for a while, but the most useful one has to be the void orb that unleashes multiple hits to the nearest group of enemies it finds. For the most part, enemies are similar to earlier games in the series. The most annoying of which are still the gorgons with their ability to turn you to stone, leaving you vulnerable to instant kills. A new flying creature has a similar ability too (did not want). There’s also a new large enemy that carries an electrified boulder that you can turn against him for a messy end. The bosses vary from the opening massiveness of the sea-monster Scylla, that follows you around even when you’ve reached dry land, in similar fashion to the Apollo statue of an earlier title. Then there are the ogre-sized monsters like Callisto, followed by a mix of human-sized bosses. After taking on the Titans in GOWIII the boss fights feel like a bit of a let-down, but I suppose the PSP can only handle so much, despite the great talents of Ready at Dawn. Sony’s Santa Monica Studios (GOWIII) have given a helping hand and you can see little touches that they’ve influenced. Such as the way quick-time-even prompts have been put to the side of the screen to give you the best view of the action. The last PSP game suffered with annoying analogue stick QTEs as it had difficulties reading half-circle rotations, thankfully these have been ditched for the much more reliable full-circle ones. The levels follow a familiar pattern of grand buildings of ancient cities with corridors, halls and courtyards. They’re supported by caves, lava tunnels, cliff faces and mountain passes. The usual haunts for Kratos really. There are lots of side-paths for you to explore which usually reward you with the all-important items for extending your health, magic and fire meters. The puzzles aren’t as difficult as earlier games, which keeps the game flowing at an almighty pace. Some may be displeased at the toning down of this side of the game and when considering the short length of the game, they may have a point. Or you could just look at it as you definitely won’t be needing to check online at all to progress, either that or we’re getting smarter (stop laughing). Graphically the game batters the competition. The huge views that loom towards Kratos as he runs up a long set of stairs, of epic cities and temples are just as pleasing as the game’s PS3 counterpart. There are lots of little atmospheric effects such rain and fiery embers floating through the air that raise the game above the competition. Nobody else seems to be making half as much effort on the PSP. Maybe Ready at Dawn should start looking into developing for the PS3, potentially on a rotating basis with Santa Monica Studios, like Call of Duty did before the Infinity Ward meltdown? Or maybe not. While it was sad to see the game end in just under six hours, it shouldn’t be much of an issue as you can already pick it up from as little as £16.99. You can play the game again using unlockable items that will make life easier and there are separate challenges and unlockables that can be bought with spare red orbs. They’re really expensive so they should keep you going for a while. The storyline gap between God of War II and III is pretty much non-existent, meaning that there isn’t really any room for any more prequels or inbetweeners. Now would be a good time to say goodbye to this overall storyline and ancient Greece. If we are to continue with Kratos we think a new setting is in order. Vikings and Norse gods anyone? 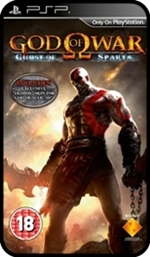 The Short Version: The action in Ghost of Sparta towers above the competition on the PSP with some huge set-pieces and awesome combat as standard for the series. The graphics are unmatched too in this short adventure that is a fitting end to the current Kratos saga. con varias opiniones. En absoluto se da mucha documentacion. ﻿ ¿Seria Posible anunciarme el lugar se encuentra has localizado tanta referencia eficaz? Hurrah! At last I got a blog from where I know how to actually obtain valuable information concerning my study and knowledge.